Talk about flavorful! In an effort to use up the leftover pork from yesterday’s roasted pork loin with roasted garlic and arugula vinaigrette and a butternut squash that was nearing it’s end, I came up with this recipe. I remembered reading about a butternut squash polenta somewhere, and after a few minutes of Googling, found what I was looking for: this delicious sounding dish from Food & Style. After making some pretty significant changes to suit our tastes and what I had on hand, I ended up with a meal that was an absolute explosion of flavors. The polenta was decadently creamy and bursting with the yummy flavor of butternut squash. The spinach had just enough heat and garlic to really shine against the fattiness of the pork without overwhelming the gentle acidity of the red wine vinegar and distinctive taste of the Caraway seed. This dish was also amazingly easy to prepare, especially since so much of it could be done ahead of time. I roasted the squash, shredded the pork, and then left the house for most of the afternoon. Once Zak was home from work and ready to eat, all I had to do was reheat the pork, whip up the polenta, and sauté the spinach, which only took about 20 minutes. We both absolutely loved this and I’ll be making it again in the future. Almost any leftover meat would taste great on top, or it would be delicious as a vegetarian option. In a heavy, medium sized saucepan heat Brummel & Brown over medium-high heat. Add garlic and sauté, stirring frequently, until golden brown. Add onions, Caraway seed, marjoram, and salt and pepper and sauté, stirring occasionally, until onions are lightly caramelized (about 10-15 minutes). Reduce heat to medium-low and add pork, chicken stock, and red wine vinegar. Simmer, covered, roughly one hour. From time to time, reduce heat to low and use two forks to shred the pork. Return heat to medium-low and re-cover. If necessary, uncover and simmer until sauce reduces so that pork is barely wet about 15 minutes before serving time. Spray flesh side of butternut squash with cooking spray and season liberally with kosher salt and black pepper. Cover a baking sheet with tinfoil (for easy clean up) and position a roasting rack over baking sheet. Spray roasting rack with cooking spray. Place squash halves flesh side down on roasting rack and roast 50 minutes or until very tender. Let squash cool. Scoop out flesh of one half of squash and place in food processor, saving the other half of the squash for another purpose. Process until mostly smooth. Add Greek yogurt and process until completely smooth. Set aside. This portion of the recipe can be prepared up to a day in advance and chilled in the refrigerator in an airtight container. In a large saucepan, heat chicken stock over medium-high heat until at a rolling boil. Slowly whisk in polenta. Reduce heat to medium low and simmer 10 minutes, stirring frequently, until most of liquid has been absorbed by the polenta. Add the asiago and Butternut Squash Puree (see above) and heat until cheese is melted and puree is heated through. In a medium saucepan, heat olive oil over medium heat. Add garlic and sauté until tender, 1-2 minutes. Add paprika and crushed red pepper, followed immediately by chopped spinach. Sauté, stirring constantly, until spinach is heated through. 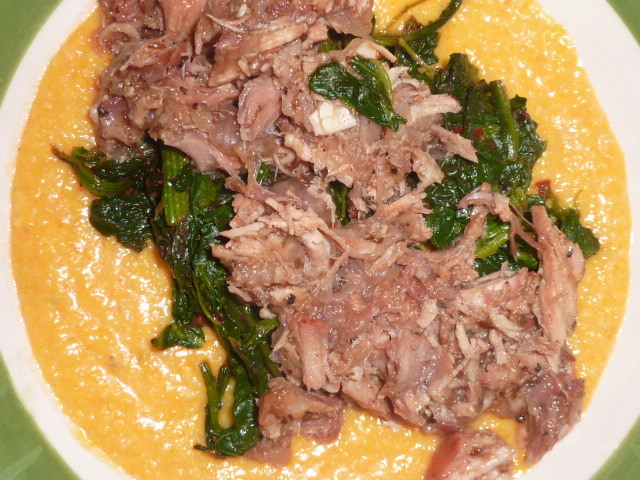 To serve, place polenta in bowl topped with the spinach followed by the pork and a few tablespoons of juices from the pork. Zak and I recently found some beautiful buy one, get one free pork loins at our local supermarket and couldn’t pass up the deal. 10 pounds of pork for $9.00? Yes, please! While figuring out what to make with them, I came across a tasty-sounding recipe for Roasted Pork Loin with Roasted Garlic Vinaigrette I had set aside from La Bella Cook. I made significant changes to the original recipe, but since it was my inspiration, I thought it was only fair to throw the link on here. The pork loin turned out tender and incredibly moist. I’ve been a fan of roasted garlic for awhile now, but Zak recently became a convert when his friend threw a head on the grill over the weekend of the Fourth and has been begging me to make some since. This meal was super garlic-y, but the arugula brightened it up and really made the pork sing. I served it alongside some steamed broccolini. Cut small slits in pork loin and insert halved garlic cloves evenly throughout meat. In a small bowl, combine garlic salt, black pepper, paprika and dried sweet basil. Rub over entire pork loin to form a crust. Let pork loin sit in refrigerator a minimum of 4-6 hours. Heat oven to 350° and cover a shallow, oven-proof casserole dish with tinfoil. Spray with cooking spray. Spray a large nonstick skillet with cooking spray and heat over medium-high heat. 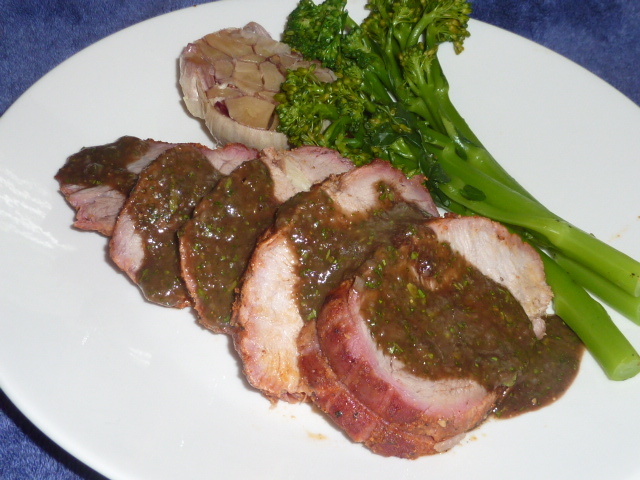 Brown pork loin 3-4 minutes per side until golden brown crust forms over entire loin. Place browned loin in casserole and cook roughly 20 minutes per pound until internal temperature reaches 160°. Remove from oven and wrap with foil. Let rest 15-20 minutes. When roughly 45 minutes to an hour is left in pork cooking time, drizzle halved garlic head with olive oil and dust with kosher salt. Wrap each half tightly in tinfoil and place in oven. Remove with pork loin. Reserve half of head for sauce and half for eating with the pork. While pork is resting, combine garlic cloves from half head of garlic (removed by squeezing at the base of each clove), arugula, balsamic, salt, pepper, and sugar in food processor. Pulse until blended. With food processor running, drizzle oil into machine. Taste and re-season as necessary. To serve, slice rested pork into 3/4″ thick slices and drizzle with vinaigrette.